Sorry for my blog absenteeism! The last few days I have been filled with sharing food, drinks and memories with great friends and family in Calgary. 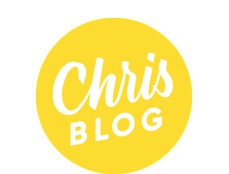 As I mentioned a few weeks ago, this month also marked an exciting career transition in my life, as I ready myself to pursue freelance design full-time. I think it was perfectly fitting that yesterday was the winter solstice, a day that symbolizes both an ending and a beginning. As I look backward, I am so grateful for everything that has happened this past year, and I can't wait to see what the future has in store in 2012. 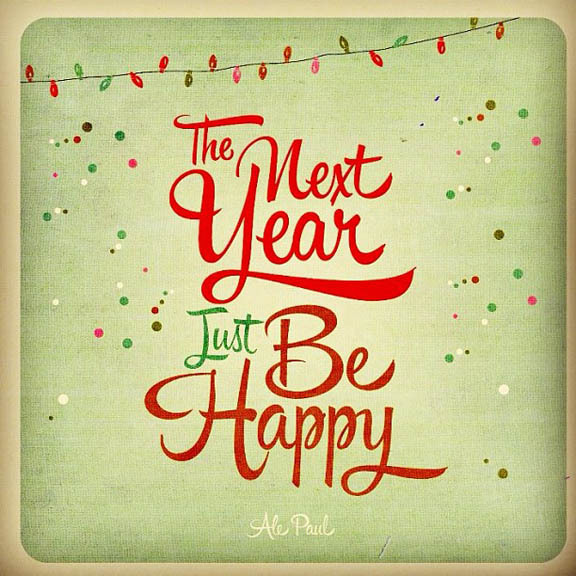 I want to wish everyone (friends old and new) a wonderful holiday season, and a happy-filled new year. 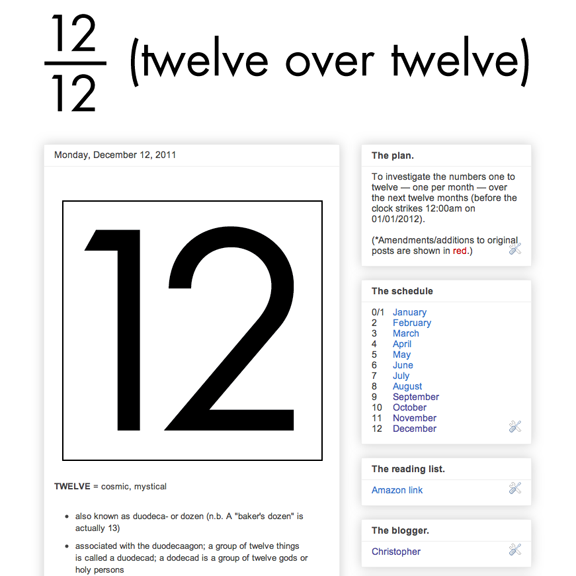 Twelve months after the first post, 12 over 12 (my side blog dedicated to the numbers 1 to 12) is complete! Click here to check out all the numbers. 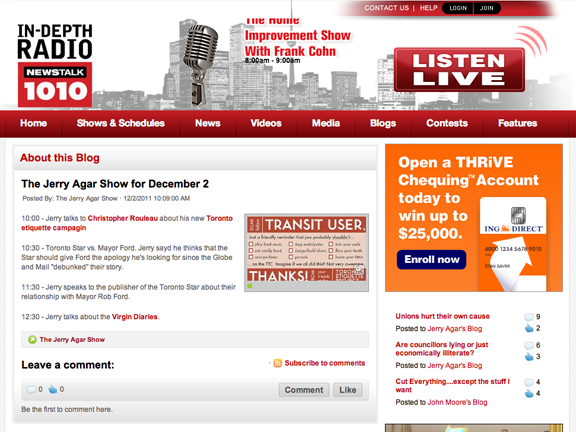 After the first two days, the blog had gotten 3500 hits and had coverage on BlogTO, Global Toronto, Treehugger, Newstalk 1010 and CBC Radio 1. On day 4 (Monday), things went berserk. The project was featured on the cover of the Toronto Star, I had four radio interviews (CBC Radio Metro Morning, 96.9 FM Radio Humber, AM 680 Radio, AM 640 Radio), my first on camera interview on Global TV (at my apartment! ), and the hits jumped to 7300. So, why full-circle? I am very proud of my small town roots, and unbelievably grateful for the support of my family through the last 29 years. I wouldn't be who I am today without them. They taught me the importance of hard work and discipline. They taught me to respect others, and respect myself. And they taught me to say 'please' and 'thank you'. As the blog surpasses 10,000 hits and 1300+ downloads this morning (just moments ago), I humbly thank everyone for embracing this project. At this point, the numbers don't really matter. It's not about the cards. What matters to me is that there are good people are out there (in Toronto, and everywhere) actively trying to make life better, just by being nicer to our fellow citizens. I think this inspires more hope than any statistic possibly can. Let me first say that growing up in Saskatchewan, I never even imagined living in Toronto. 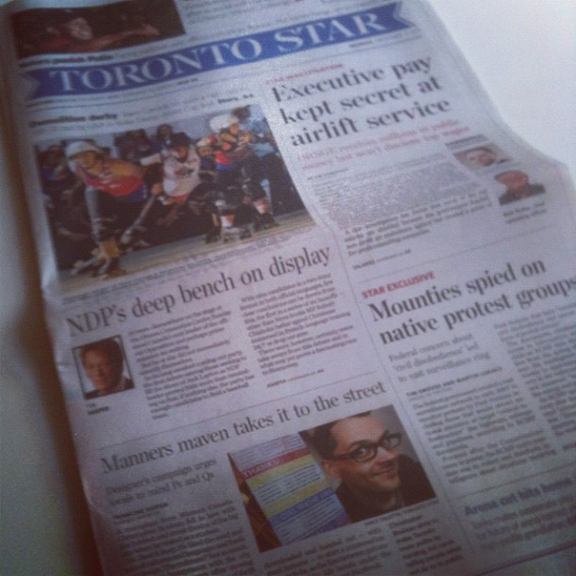 And then yesterday, I see myself on the cover of the Toronto Star. What a crazy 24 hours it has been! Here are a few quick updates on this exciting project. And then I found out that my Toronto Star interview from the weekend was featured not only in the morning Metro paper, but also on the cover of the Toronto Star. Needless to say, I am blown away with the response. I cannot thank everyone enough for the kind words of support. To me this project is already a success because it has sparked a conversation in the name of good. Even if you don't agree with the premise, you can't argue that Torontonians are overwhelmingly in favour of making positive change for their city. And I think that is a great sign. I could not be happier with these results. A project of this nature doesn't work without people, and these numbers seem to indicate that Torontonians are interested in making positive change - together. Thank you everyone, truly. "What about a Cyclist card?" Yes - there seems to be a concern for cyclists' road behavior. I actually drafted a Cyclist card in an earlier version, but I decided to exclude it for a couple reasons: 1) it seemed impractical because of how hard (and not to mention, dangerous) it could be to interact with a cyclist on the road, and 2) it was important that the cards all fit vertically on a letter-sized sheet to ensure the cut-and-accordian-fold format, and 6 cards just didn't fit. If you still want a Cyclist card, let me know, and I'll whip one up! 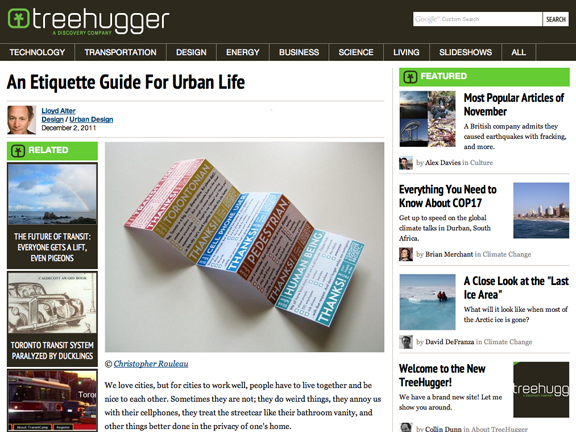 "What about cards for other cities?" I hear you. 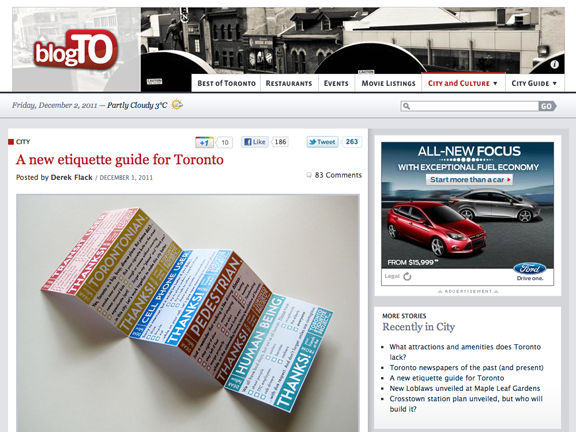 I was going to mock up an alternate set of cards entitled "Urban Etiquette Project", but as the design took shape, the cards took on a very distinctive Toronto esthetic, which seemed like it would be incongruent in other cities. But having said that, the project itself remains flexible and could be easily adapted to take on any city's particular flavour. Want cards for you city? Let me know, and I'll see what I can do. "What about cards that congratulate good behaviour instead of pointing out bad behaviour?" I think this is a great idea! And I think it is even greater that this project is sparking new ideas. My hope is that this project will grow and evolve in unexpected ways that empower people to do more good, in Toronto and everywhere. The greatest changes have always started with a small idea. "Do you actually think this will work?" 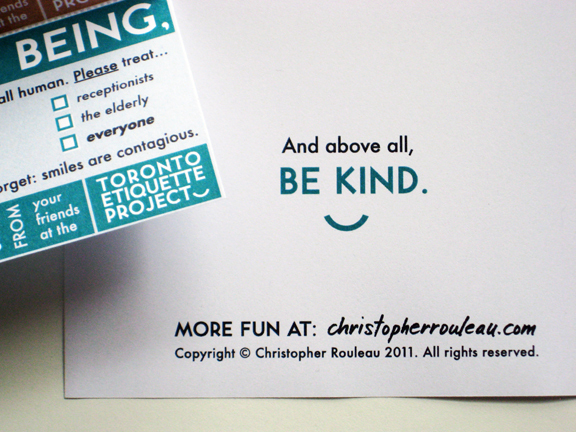 The Toronto Etiquette Project is a positive (not negative), active (not passive), collective (not selfish) way of thinking about our common condition. These cards are not weapons or violation tickets. They are not intended to offend, and should never be used in an offensive manner. And they are not a substitute for real dialogue. 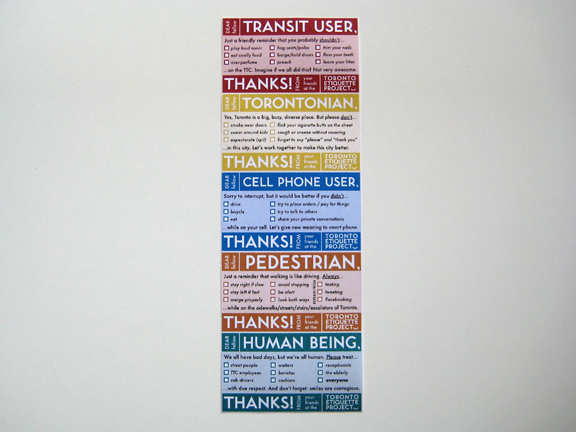 Please think of them as a conversation starter - a way to engage with your fellow citizens. As you carry the cards in your wallet/purse, think of them as a reminder that we should not be afraid to talk to people. If we can't find healthy ways to communicate with each other, we are in deep trouble. [And this might seem terribly obvious, but I feel like I need to say it] please use your common sense, and do not risk your personal safety if you decide to use these cards. I do not want people to get hurt. These cards will not always be appropriate. If you have any doubt about the safety of the situation, maybe reconsider. We don't want to see these cards used as evidence in court. 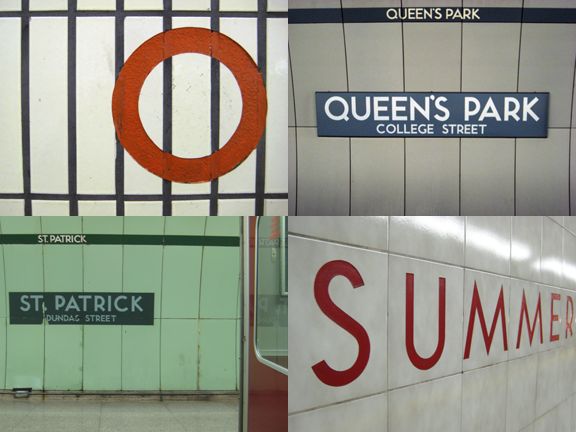 I first visited Toronto in the spring of 2007, and fell in love with this city. 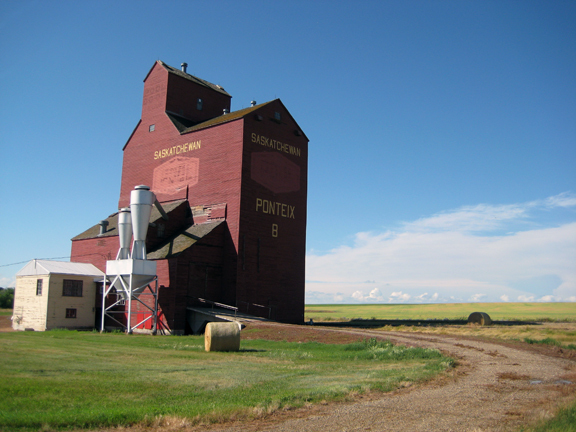 Growing up in a small town in Saskatchewan, and then in Alberta for 8 years, I had never experienced a living, breathing metropolis. This city was alive. And through a series of fortunate events, I was able to move to Toronto in June 2009. The love affair began. Shortly thereafter, the honeymoon period subsided, and I started to notice that some of the stereotypes that Western Canadians purport about Toronto were kind of true; depending on the day, Toronto could be quite fast-paced, impersonal, and, well, rude. On a Friday afternoon in downtown Toronto in the middle of an August heat wave, you won’t see a lot of smiles or hear a lot of niceties; you’re more likely to hear car horns blaring and see the occasional middle finger. Toronto is the largest city in Canada, and the the fifth most populous city in North America. Toronto is one of the world's most diverse cities by percentage of non-native-born residents, with about 49% of the population born outside Canada. Summer in Toronto is characterized by long stretches of humid weather. Usually in the range from 23 °C (73 °F) to 31 °C (88 °F), daytime temperatures occasionally surpass 35 °C (95 °F) accompanied by high humidity making it feel oppressive during these brief periods of hot weather. “...while many are quick to be rude, the rest of us are often too polite to say anything. […] Thankfully ... it’s perfectly polite to point out bad manners, so long as it’s done as discreetly as possible without raising one’s voice or using profanity. Indeed, it may be the only way things will change." This paradox stuck with me. As Canadians, we seem to be programmed to resist confrontation, but at the same time, we are also known for our friendliness and generosity. We want to make things better for everyone, for the greater good. How could we align our passion to help with an obvious need improve overall public manners and etiquette? 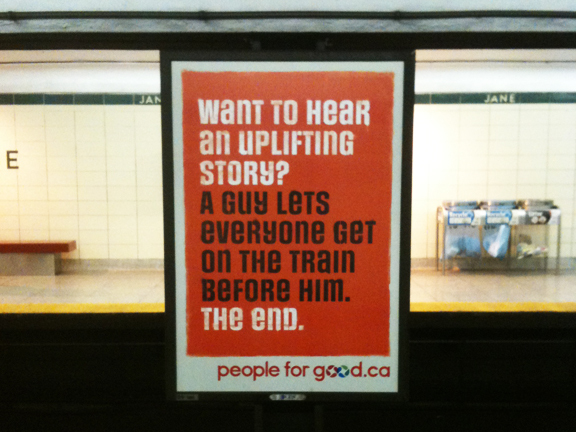 More recently, an interesting not-for-profit campaign that popped up in large cities across Canada (including Toronto) was called the People For Good campaign, spearheaded by Zak Mroueh (of Toronto’s Zulu Alpha Kilo) and Mark Sherman (of Montreal’s Media Experts). With their large-scale posters and billboards (and a companion iPhone app), their objective was to “make the world a better place, one good deed at a time.” When asked for comment by the Globe & Mail in July of this year, Mroueh elaborated that “something like this can make people think differently, truly think more positively.” I couldn’t help but agree. I focussed on the aforementioned idea that it’s perfectly polite to point out bad manners, so long as it’s done as discreetly as possible. 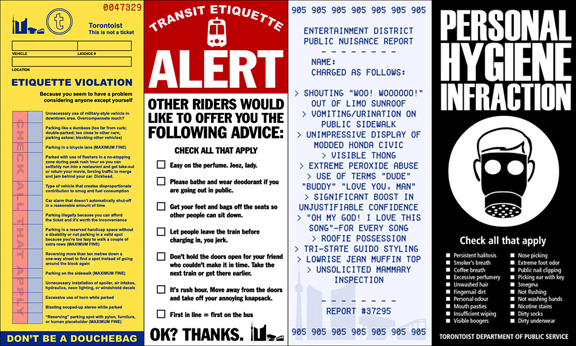 These 5 cards can be printed at home or work (in colour or black and white), and used discreetly in the most common violations of public etiquette in Toronto (as compiled from personal experience, suggestions of friends, and online blogs and forums). 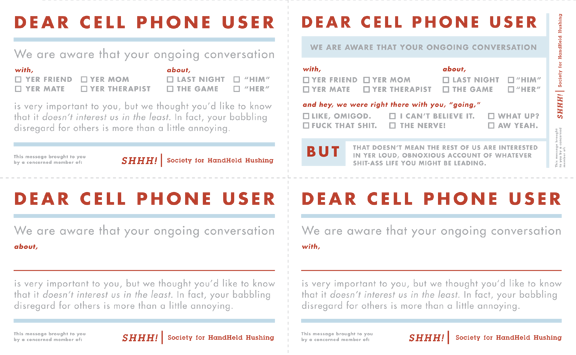 As long as people approach this project with a sense of playfulness and reasonable discretion, I feel that these cards have the potential to 1) improve public etiquette in Toronto, 2) engage people in human-to-human discussion and 3) put a smile on people’s faces. Inspired by the words of Robert Wong, (Executive Creative Director at Google Labs) at the recent Design Thinkers conference in Toronto, designers should always strive to help and delight. 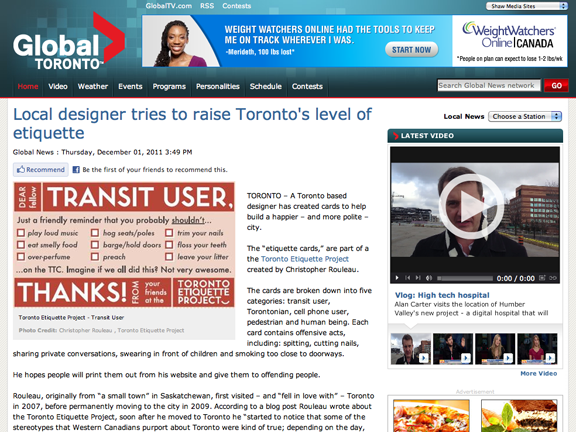 On November 10, 2011, the Toronto Star proclaimed that Toronto is still the most least-liked city in Canada, especially by our Western friends in Alberta. And while my love affair for Toronto continues, my Western roots can’t ignore some of the cold, hard, nasty truths of modern metropolises like Toronto. Call me a dreamer, but I don't believe this has to be this way. Did you know that Toronto used to be called "Toronto the Good"? 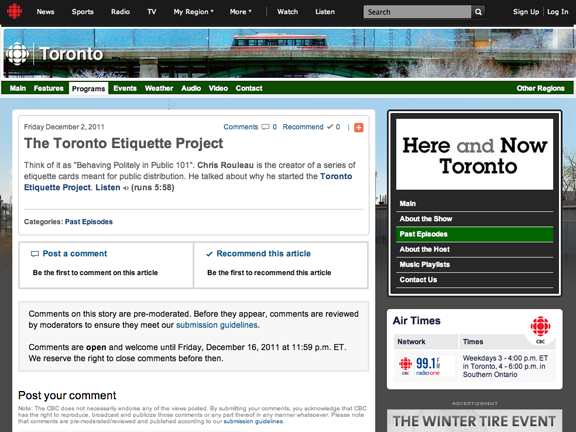 My hope is that the Toronto Etiquette Project will offer a fresh perspective on Toronto’s infamous civility problems, and will reinvigorate people to engage in collective, positive change. So, let's get this started. View the companion site here, or download the cards here. And please email and share the links on your social networks so we can get them in as many hands as we can. Let's make Toronto Greater. Together. p.s. I am always open to hearing feedback, criticism, recommendations or revisions. Please send me an email or find me on Twitter.